This morning, I was having the usual breakfast and coffee with my girlfriend with CNBC on in the background on mute. We were discussing the Regis and Kelly show and who was going to be picked as her new co-host to replace Regis. A very big decision in our house. Then the jobs report hit at 8:30, the most important piece of economic data of the month, and so we took the TV off mute to listen. The report came in with an increase of 243,000 jobs in the month and the unemployment rate fell to 8.3%. The CNBC reporters were falling over themselves with excitement on how incredible the jobs recovery was progressing. The stock market roared higher on the news, which confirmed their new bullish outlook on the world. After listening to their euphoria we both said, "wow, that sounds really good." I kissed her goodbye and headed to the office to get on with my regular work day. For most people it will end there. They will read the headline, see Obama's approval rating rise, and see the stock market rise to confirm that everything is good with the world. Some will take a few minutes to check in with this site for the truth, even if it may not be what they want to hear it. So with that, let's take a look at the real jobs report. As I have discussed previously, on the first Friday of the month (the day the jobs report is released), the unemployment rate is determined by the number of people working divided by the number of people in the labor force. If you have 200 people on an island and 92 are working, you have 46% of the people employed, or 54% unemployment. That number is very scary, so the government on this island decides that it will change the way they calculate the number of people unemployed. Let's say that of the 200 people living on the island, 100 have been out of work for so long that they have given up looking for a job. "Aha!" says the the government, "these people are no longer in the labor force because they have given up. They should no longer be counted." 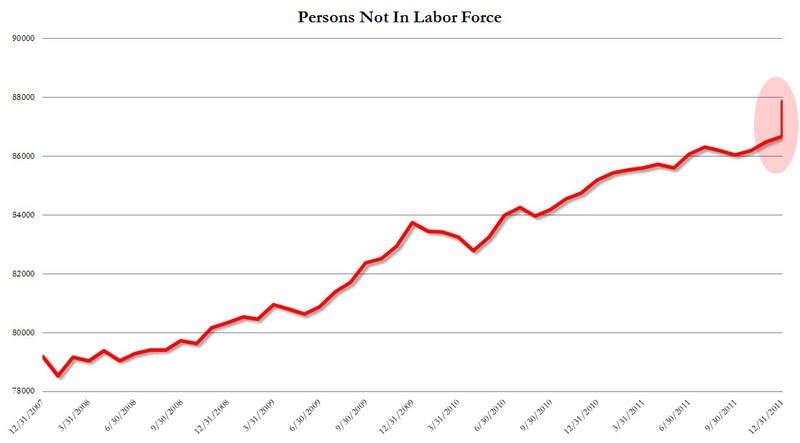 Now there are 92 people working with only 100 people in the labor force. This means they now have only an 8% unemployment rate! 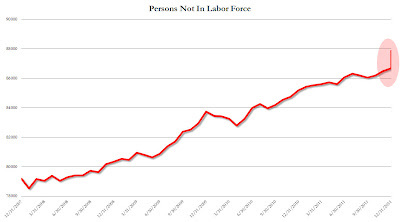 The following chart shows the steady rise of people in America "leaving the labor force" since our depression began in December of 2007. Look at the highlighted portion of the graph showing this month where 1.2 million Americans left the labor force in a single month. This number is staggering. I know exactly what you are thinking after looking at this graph: Millions of baby boomers are now entering retirement and leaving work, meaning they obviously would not be looking for jobs, right? I understand, that was the first response that I had as well. 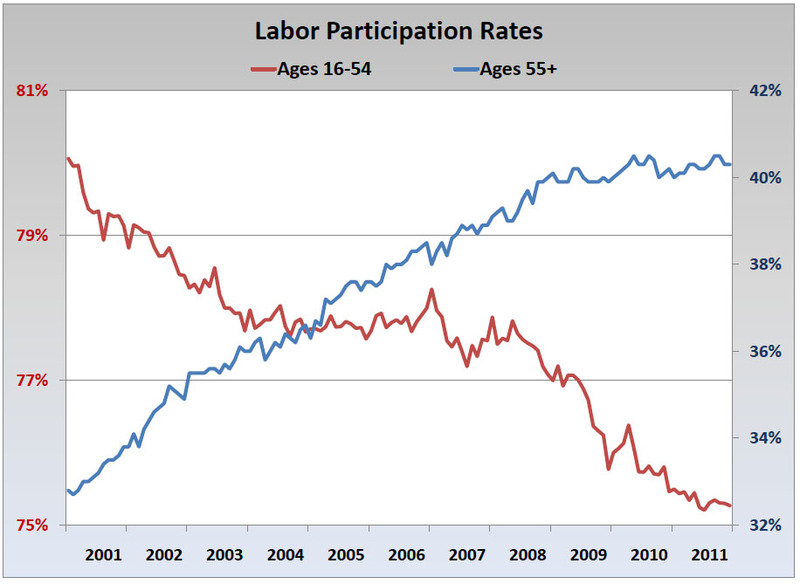 The following chart shows the labor participation rate for Americans over the age of 55 (blue line) vs. the participation rate for Americans 16 - 54 (red line). 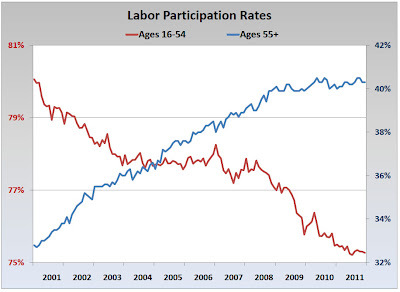 As you can see, the number of 55 and older Americans entering the workforce is surging, while the number of Americans 16 - 55 in the workforce is in free fall. The trend is simple. More Americans that should be retiring are having to go back to work and look for a job while those that are in their working age have been out of work for so long that they are giving up. Based on the 1.2 million spike in the chart above, it appears giving up looking for work is now going mainstream. What about the 243,000 new jobs created? That has to be great news right? Of the 243k jobs reported, 113k are estimated to be low wage jobs. In addition, this month's report showed a record surge in part time workers (highlighted in graph below). Do not be fooled by the media machine. The depression that our economy entered in December of 2007 has not ended. It has been covered with trillions of dollars in both deficit spending and printed currency, which is the equivalent to painting the exterior of a home as it is being eaten away at the foundation by termites. One day someone will walk by and see the home laying in rubble and wonder how such a beautiful home could have collapsed so quickly. Our day of reckoning is coming, and the termites are now growing by the trillions year after year. All charts courtesy of Zero Hedge. 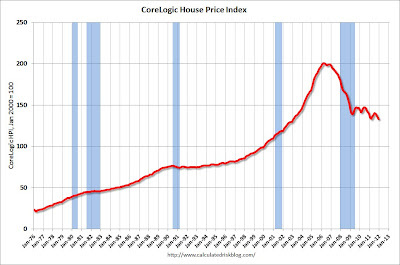 Core Logic released their December home price index this morning, showing prices fell 1.4% month over month, fell 4.7% year over year, and the index is now down 33.7% from the peak. Anyone who has called a housing bottom since February of 2006 has now been wrong for 6 straight years running. Interest rates hit a new all time record low this week at 3.87%. 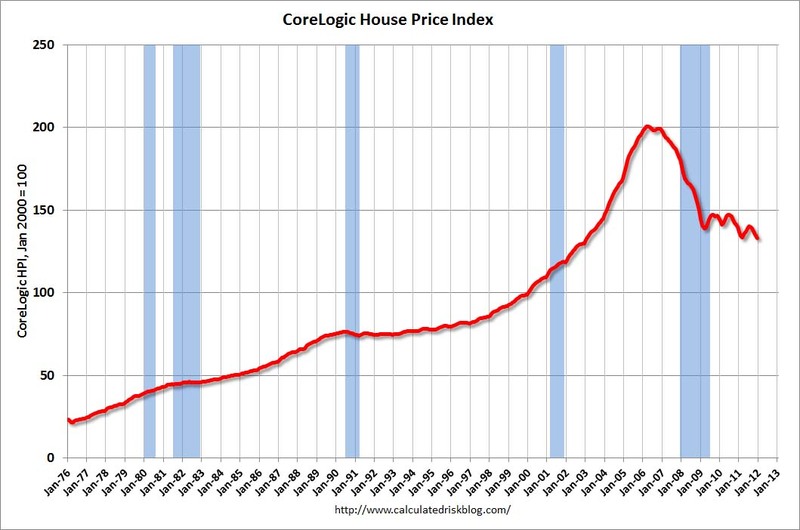 When rates begin to move off these rock bottom levels and the shadow inventory begins to enter the market, we will experience the final flush downward in prices. While all eyes are on how the bailout crew in Europe is going to handle the debt write down in Greece, there is a far more important story playing out behind the scenes in the banking system. As discussed here in the past, the major problem with writing down the debt of Greece will be its impact on the banking system. If a bank holds $100 in Greek bonds and the debt is written down 50%, the bank must take a loss on their balance sheet of $50. 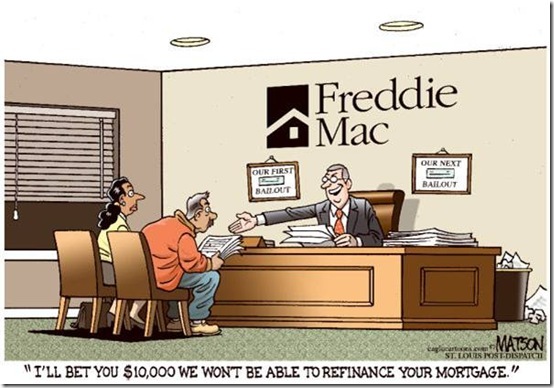 In addition, banks have written insurance contracts, called CDS, that must pay out large sums if the debt of a country is considered in default (similar to your homeowner insurance paying out if your home is hit by a hurricane). I have covered this simple concept in the past, but I wanted to review it before we move into how the financial leaders in Europe are handling the situation. At this point, it has been strictly forbidden for the European Central Bank (ECB) to commit to a Quantitative Easing program - meaning they print money and buy European bonds directly. A program like this (being used in America, Japan, and the UK) would immediately calm the markets. Why can the ECB not print? Because Germany, the biggest economic force in the EU forbids it. 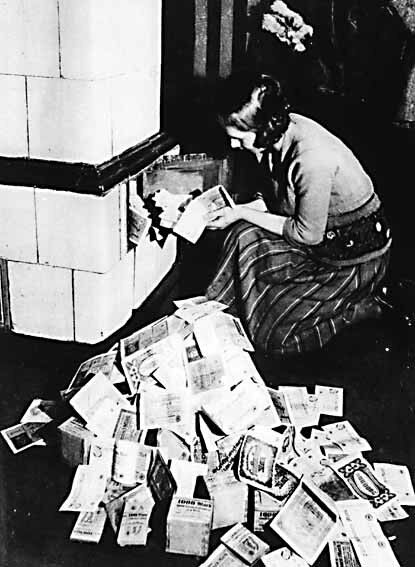 Germany suffered a devastating hyperinflation in the early 1920's which led to economic chaos and ultimately the rise of Hitler. The perverse effects of money printing still lingers in their memory. So what has the ECB done to bypass big bad Germany? They have gotten creative. Throughout last year, they created a "sterilization" program. This means that they would purchase bonds of troubled European countries and then remove that same dollar amount somewhere else in the banking system. This process creates no "net" new amount of money in the financial system but forced capital to be directed at the troubled European bonds. As the markets began to spiral out of control during the fourth quarter, they realized this would not be enough and they needed a new program. Enter the LTRO. You can think of this new program as a type of one-day sale. The ECB has told banks they will purchase assets on their balance sheet in exchange for fresh cash. The catch: the banks must take the assets back on their balance sheet sometime in the next 3 years. European banks are preparing to tap the European Central Bank’s emergency funding scheme for up to twice as much as the ECB supplied in its debut €489bn auction last month, providing further evidence of the sector’s liquidity squeeze. Several of the eurozone’s biggest banks have told the Financial Times that they could well double or triple their request for funds in the ECB’s three-year money auction on February 29. “Banks are not going to be as shy second time round,” said the head of one eurozone bank at last week’s World Economic Forum in Davos. “We should have done more first time." Three bank chief executives, all of whom asked to remain anonymous, said they were planning to increase their participation twofold or threefold. An LTRO of this magnitude is going to make the ECB's balance sheet mushroom even larger in size. It will also provide the banks with a tremendous amount of fresh capital to shore up their balance sheets. It is expected that the Greek write down will take place sometime in March. Can you see how the ECB is getting ahead of the write down? This program does nothing to help the solvency of the PIIGS countries, or the people living there, but it protects the banks. While the citizens of these countries and Germany are distracted by the headlines on write downs and job losses, the back door bank bailout taking place behind the curtain is invisible to the untrained eye. 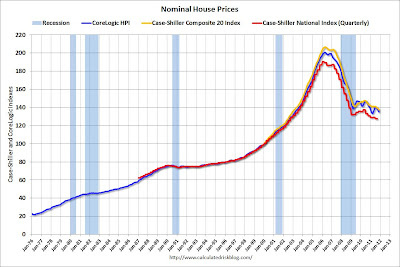 The chart below shows the home price indexes released this past month from Core Logic (blue line) and Case Shiller (red and yellow line). 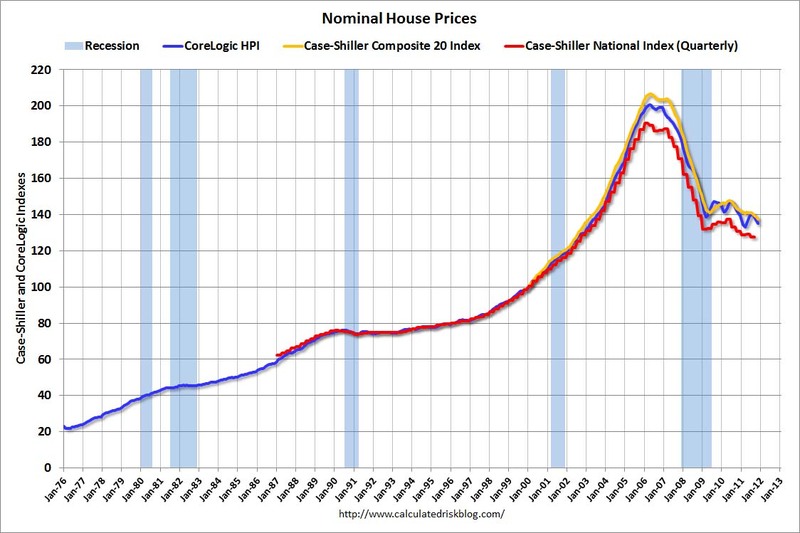 The price declines continue month, after month, after month. Buckle up because we have just under 10 million (if price declines stopped today) homes in shadow inventory waiting on deck to flood the market with supply. "The trend is down, and there are few, if any, signs in the numbers that a turning point is close at hand," says David Blitzer," chairman of S&P's index committee. 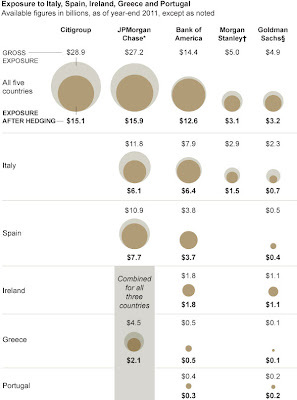 Excellent graphic below showing the total debt exposure each of the "Too Big Too Fail" United States banks have to the PIIGS (Portugal, Italy, Ireland, Greece, and Spain), all of which are currently insolvent and on life support from the IMF, ECB, and other European nations. The second one, "exposure after hedging," I find interesting because this is the only exposure banks discuss when talking about their balance sheets. It means that Bank of America may have $14.4 billion in total sovereign debt on their balance sheet. As a hedge, they have bought insurance (CDS) against the possibility of default on the debt or they have purchased another derivative type such as a put option. Both of these tools are beyond the scope of this conversation to explain, but the important part of the "hedge" (which is never discussed) is that the payment of the hedge or insurance must be made by another entity - most likely another bank. If Italy were to default and Bank of America purchased their insurance through a French bank (French banks hold the lion's share of Italian debt), then that bank will have closed its doors long before Bank of America has the chance to collect on the insurance payout (think Lehman). Can you see how the financial system is interconnected? This is why no one is allowed to fail and we continue to move through a series of rolling bailouts backstopped by the global central banks. Do you think their printing has slowed since you have not heard news of quantitative easing recently in the news? Not a chance. The following graph shows the total growth of the balance sheets for the largest central banks around the world. The last man holding paper currency loses when the music stops. For more on the "next" sovereign crisis see Shorting Japanese Government Debt: The Trade Of The Century. 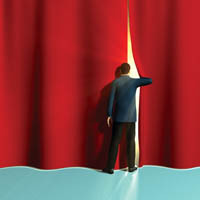 I dedicated a major section of the 2012 Outlook to the coming Japanese debt crisis. I want to push further on this topic today because when bond yields are low, as they are today in Japan, investors pay absolutely no attention to that nation's balance sheet. The following chart shows the 10 Year government bond for Greece from January 1998 (8%) to October 2009 at under 5%. During Halloween in Greece in 2009, there was not one report, discussion, or mention of trouble in their bond market. The following chart shows the 10 Year government bond for Portugal during this same period, January 1998 (at less than 5.5%) to October 2009 where it fell under 4%. As with Greece, there was not a single headline from the media at this point that trouble was even possible for interest rates in Portugal. Before we move forward, it is important to understand that at these points (October 2009) both these countries were insolvent and their debt should have been rated as junk. A junior finance analyst at a local community college could have spent 15 minutes reviewing their balance sheet in terms of income, expenses, and future debt projections and come up with the fact that their bonds had no right being close to the "risk free" ratings they held. Let's fast forward to today. The following chart shows Greek 10 Year bonds from January 1998 to January 2012. As you can see, the chart, in just a few short months, has gone parabolic. Any demand for Greek bonds has disappeared and any investors holding the debt have dumped in mass. The country financially has suffered a heart attack and now lives only on life support from the IMF and bailouts from the rest of Europe. The next chart shows the Portugal 10 Year bond from January 1998 to January 2012, completing their chart to present day. Their bonds, just like Greece, have begun to move parabolically higher. They have also accepted their first bailout and are moving toward the point where any access into the debt markets will be unavailable (see Portugal: Rising Tide Of The 10 Year Bond). 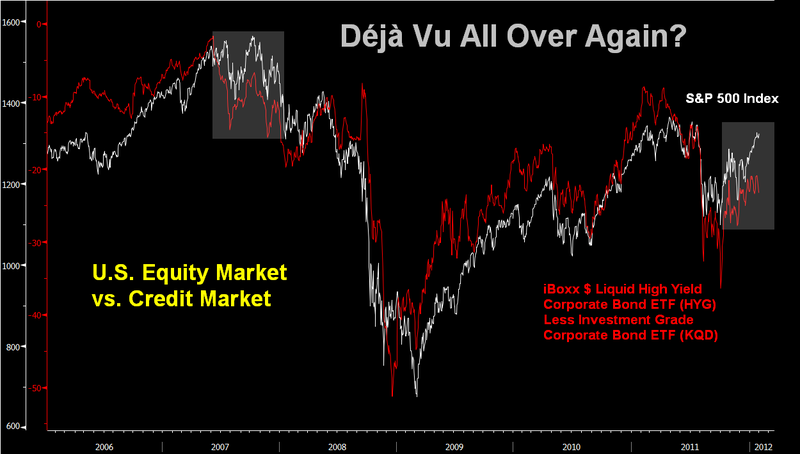 The last chart shows the Japanese 10 Year government bond from January 1998 to today, January 2012. The rates have moved from 2% to under 1%. The market has priced this debt as "risk free". No media outlet discusses a coming problem with Japanese rates. Why would they? The market knows when a country has the ability to pay their debt services and how to price their bonds accordingly. Right? I will attempt to dig into the current Japanese finances further using a highly specialized form of financial modeling called algorithm CS. Also known as common sense. Japan Post Holdings, the largest financial institution in the world holds over $1 trillion in Japanese government bonds, which makes up 75% of their total holdings. The retirement fund is now liquidating (selling) $80 billion per year in government bonds to pay out benefits, and they want to further diversify (sell more bonds) their holdings. Japanese banks hold a staggering 25% of their assets in government bonds. Bonds lose value when interest rates rise, so if the interest rates (currently below 1%) rise just a small amount to say 2%, it will destroy the balance sheet of every major bank in Japan. The savings rate in Japan has been enormously high for the past 20 years (Japanese people were buying government bonds to save for retirement). It has now fallen to 2%, and will soon go negative (Japanese people will be selling government bonds every month to pay for living expenses during retirement). There are ETF's available to short long term Japanese government bonds. 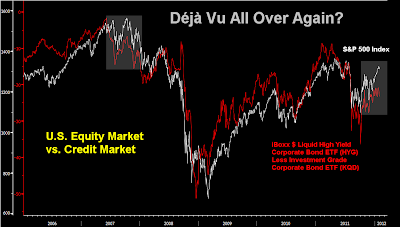 As a word of caution, there are those who tried to short subprime bonds and sovereign debt bonds early and although they were right, they had to wait and take losses in the short term to realize the gains on their investment. You must have both patience and perseverance to be first in a winning trade. While everyone continues to focus on the next bailout tranche for Greece, which is a spec of dust in terms of the global economy (but very important in terms of precedent on how bailouts will be structured moving forward for the larger countries), the smart money has already moved on to the next crisis in Portugal. Portuguese debt is the second most expensive to insure in the world (after Greece). The 5 year CDS (Credit Default Swap - a form of insurance protection against default) is now at a record 1425. The risk of default has risen to 75%. Portugal has already received a 78 billion euro (101 billion in US dollars) package. Its debt has been downgraded below investment grade, meaning many of the pension, insurance, and sovereign wealth funds cannot purchase their bonds due to their ratings restrictions. As I discussed earlier in the week, the European Central Bank appears to have let Portugal go, which was confirmed this week with the steady upward rise in rates. The 10 year rate on Portugal is far more important right now than the price of the DOW, which is moving toward la la land. Watch closely.